1600 Free Images From SiteFever.com! If you own a website or a blog, you may have some difficulty locating good quality images to use so I thought I would do you a favor. I’m giving you 1,600 of them for free. In order to save some of my bandwidth, I’ve uploaded them all to Rapidshare and they can be downloaded by clicking here. Show me some love and subscribe to my full content RSS feed if you havn’t already so you will be automatically notified next time I post some cool stuff. Domain Name Search- As You Type! Years ago I registered my first domain name. All of a sudden I woke up and found that I owned over 200 domain names! Some say that purchasing domain names can be compared with getting a tattoo- once you get one, you’re addicted. I would have saved myself a lot of time if I had known about Instantdomainsearch.com earlier! I thought that what they offered was a valuable resource, so I thought I would share it with everyone. What makes Instantdomainsearch.com different than other domain name availability websites is that it gives you the availability status as you type! It gives you the .com, .net and .org results of your search instantly. So, next time you’re looking to register a new domain name, give Instantdomainsearch.com a visit. They may save you a lot of time! I probably receive about 50 spam emails everyday from a variety of sources. I use Microsoft Outlook as my preferred email client. For the past few months, I have been shopping off and on for a good spam filter for Outlook. Each program that I found was missing either one or another feature that I was looking for, but none that I saw had every feature I wanted. 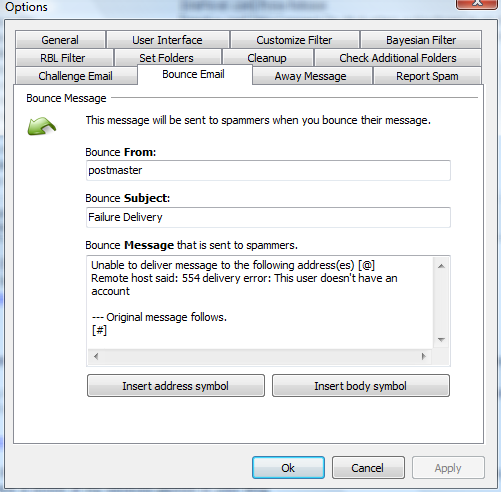 However, earlier this week I came across SpamBully 4, a great spam filter for Outlook- and it works with Vista as well. As you can see from the screen capture, SpamBully adds a little toolbar to the top of Outlook with a few easy to use buttons. Mainly, there are two main spam buttons: Spam and Fight Back. Although you can customize the specific actions for each of these buttons, the general idea is this: By clicking the spam button, you can block the users email address from appearing in your inbox and send it directly to a spam folder or to the trash. The fight back button (my favorite) can be programmed to do a variety of cool things. In addition to blocking the email address, you can send a fake Mailer Daemon to the sender to make it look as if your email address is no longer valid. SpamBully will also send an email address to the ISP of the sender and report the user as sending unsolicited spam messages. You can even view a sort of “trace route” which will show where the email originated and the path it took to arrive at your inbox. For a full list of features, you can click here. The price of SpamBully is a one time fee of $29.95. You can purchase SpamBully directly from their website. I thought that this was a very reasonable and fair price for this piece of software, which will save me much time and frustration sorting through spam emails all day. Over the last few months I have started to collect a list of all the free-to-submit directories I have run across. All of the links were valid at the time of this post, but as time goes on some of the sites may go offline, change or start charging for ads. The list should be long enough to keep you all busy for a while. FEEL FREE TO LEAVE COMMENTS WITH ANY YOU KNOW OF THAT ARE NOT YET ADDED!